MGA Alumus Matthew Young (pictured left). USCG Recruit Ensemble (pictured right). 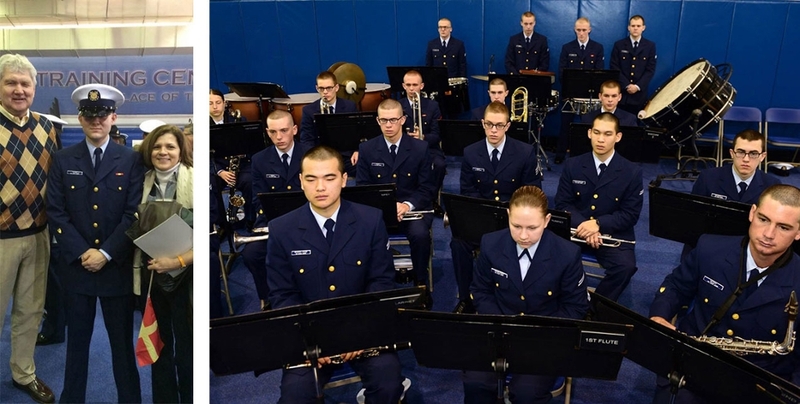 Band of Knights graduate Matthew Young recently graduated from Coast Guard basic training at the United States Coast Guard (USCG) training center in Cape May, NJ. While there he successfully auditioned for a panel including the ceremonial Bandmaster and Drillmaster and was selected to be the percussion director for the USCG recruit ensemble! Matthew is now stationed at Cape May as part of the Ceremonial Detail and his job entails instructing and performing with the recruit band at graduations, parades and other events; as well as instructing recruits on the ceremonial raising of the colors, the performing of funeral honors, and other important ceremonial duties required of members of a Coast Guard honor guard. Once he completes his current assignment, Matthew intends to audition for a percussion position in the prestigious Coast Guard band. He also plans to make the Coast Guard a career and aspires to work towards one day attaining the rank of Master Chief in the USCG. We in the Band of Knights are proud of Matthew and his dedication to the service of our country!